UPDATE: I wrote this post over two years ago when Norwex was first launching in NZ, and since then WOW it has really taken off. 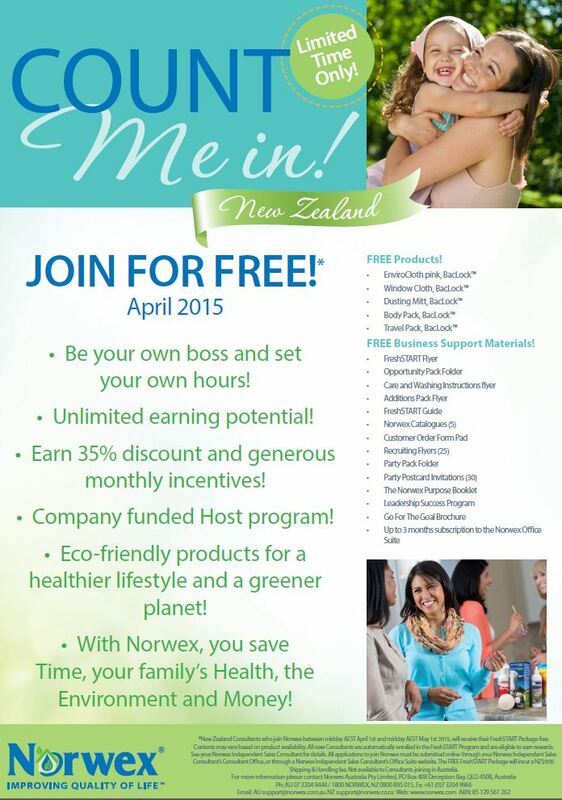 New Zealanders love Norwex, and really, it’s no wonder 🙂 The Fresh Start Package you can get on joining hasn’t changed substantially from the image below, but there is now a larger start up kit you can get (the Brighter Futures kit), and only pay the postage up front with NOTHING more to pay, if you meet a pretty simple sales challenge in the first 3 months. So, I have written you an UPDATED post about all the options when it comes to joining Norwex in New Zealand, so check it out, and then get in touch! I am so excited because I LOVE this company, and just love what they are doing to get safe, environmentally responsible products available to more and more people through-out the world. They are making it as easy as possible for people to get their first kit, make a start, and share the value of Norwex with their friends and family. Are you still looking for consultants in NZ? I live i Raglan, close to Hamilton. Raglan is an environmentally conscious , awesome community minded beach town of approx 3000 people (30 000 in summer!! ), and also happy to travel to Hamilton which is the closest city. I totally love the Norwex philosophy and would be really interested in being a consultant! please contact me if you are still looking..
Hi there, I would love to be a consultant. I live in Whitby, Wellington. I would love to join Norwex. I am currently living in Auckland but moving out to Hawera, South Taranaki mid next year. Can you please send me some info.